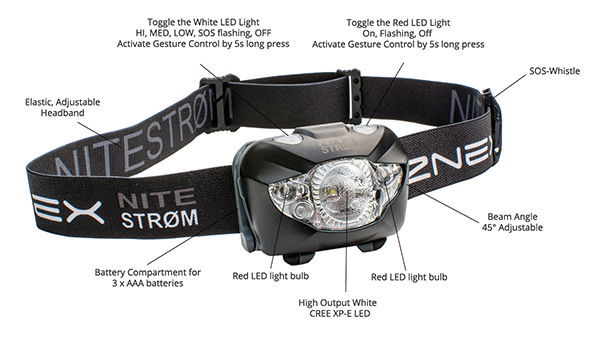 Ultra-bright 168 lumens headlamp with red light, SOS whistle, LED safety armband and Hand-Free Sensor turning On/Off. Great for Running, Jogging, Cycling, Hiking, Camping, Biking, Caving, Backpacking, Fishing, Walking your dog at night and more. 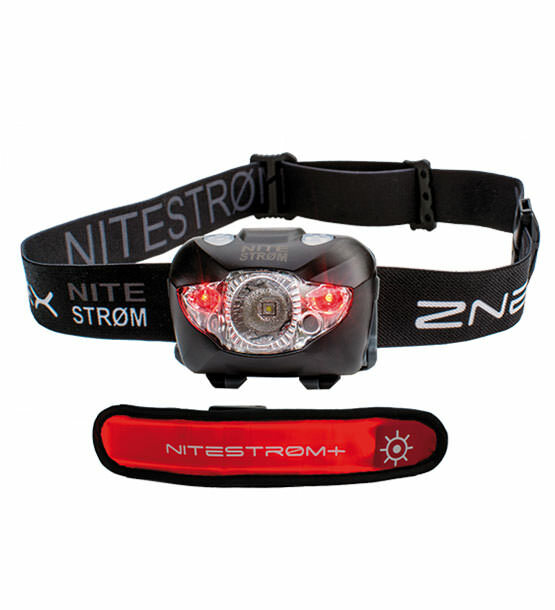 Package content: NITESTRØM head lamp, safety armband, pouch, 3 AAA batteries and manual. In the highest light level, the nitestrøm “blows” 168 lumens into the night. In the second highest brightness level there are still 76 lumens and in the lowest brightness level 11 lumens. This is how long Nitestrøm shines in the lowest brightness level. In the highest luminous level (168 lumens), the energy of the three AAA batteries is sufficient to power the Nitestrøm for 30 hours. 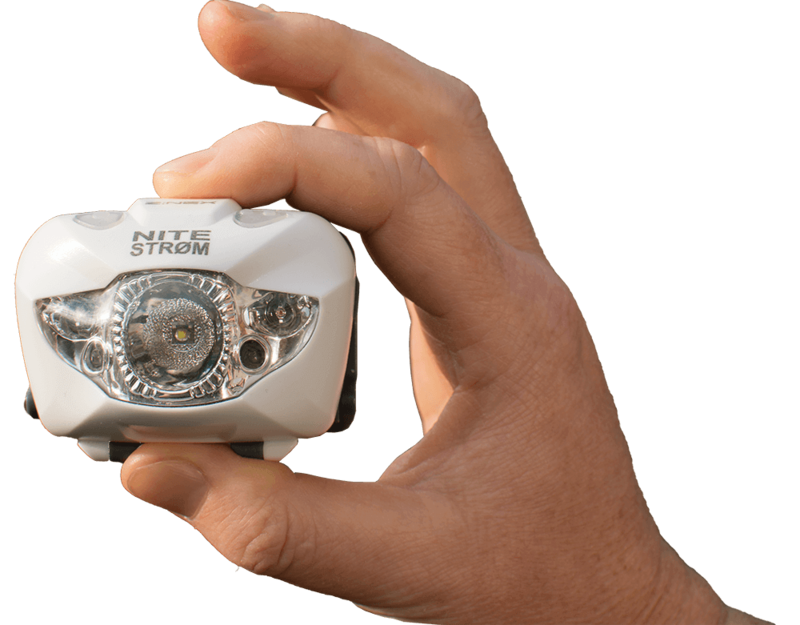 With a maximum brightness of 168 lumens, the light beam of the Nitestrøm reaches 110m. In the second highest brightness level (76 lumens), the lighting range with 65m is completely sufficient. There are a total of 6 ways to adjust the brightness of Nitestrøm. 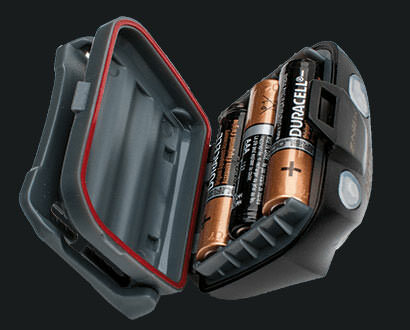 With white light: 3 brightness levels and SOS light; with red light you can choose between constant and flashing light. Are you surprised by the rain during your nocturnal running training or cycling? No problem either. 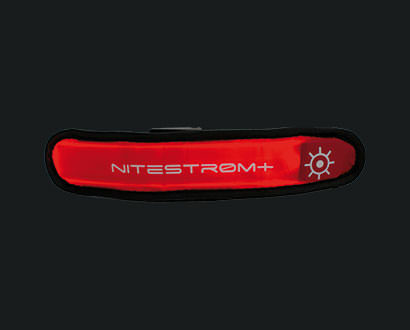 Nitestrøm will survive even the strongest showers without any damage. Seeing and being seen – this is very important at night. That’s why we have included an LED safety wristband with the lamp that is so bright that you can be seen up to 1 km away. In an emergency situation, we recommend activating the white SOS signal for the lamp and the red flashing function for the LED band. For all cases, we have integrated an emergency whistle in the headband with which you can also make yourself heard acoustically. You can buy the AAA batteries in every country in the world and therefore you do not have to rely on a socket for recharging when the light goes out the “juice”. The lamp head can be tilted over four notches to a maximum of 45 ° and thus allows individual adjustment of the light cone. The headband is elastic, washable, comfortable to wear and suitable for all head sizes (ø 15 to 30cm). 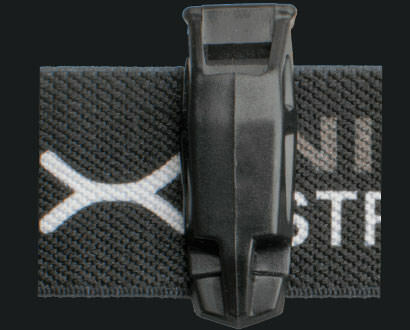 The SOS whistle can be adjusted variably on the strap. Safe on the road: this LED wristband is the ideal addition at night – it makes you visible from a great distance. 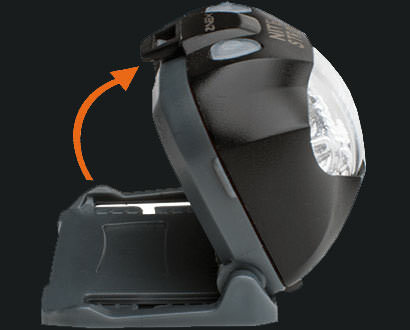 Perfect safety light for cycling, jogging, or walking your dog at night. Nitestrøm headlamp, 3 AAA Duracell batteries, 1 protective bag, 1 LED safety wristband and a manual in English. Does the motion sensor work for both white and red lights or only white? It works for both. It depends on what button you “press and hold” to activate the sensor mode. It says it has an IR sensor. Does it accidentally turn on or off if something is waved infront of it ? Yes. The headlamp will recognize any MOTIONS within 15cm in-front of “sensor eye” and react. So, it can turn on, off accidentally. If you don’t like to accidentally turn it on/off, just press on any of the two buttons, the IR Sensor function is deactivated. 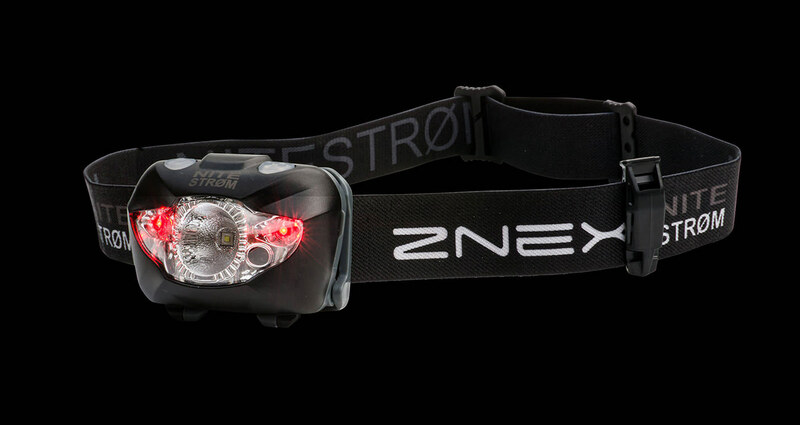 Since then, you have full control, manually turn it on/off whenever you need as usual headlamp. Can the red light be a constant light or is it always flashing? You can chose either constant or flashing light depending on your need by pressing the button, the first press will give you constant light, then if you press it again, the light will be flashing. What does waterproof rating IPX6 mean? 1) IP is abbreviation for International Protection Code which is used to classify and rate the degree of protection against dust and water. 2) X is replacement for digit when there is no data available to specify a protection rating with regard to one of the criteria. This digit usually indicates the level of protection that the enclosure provides against access to hazardous parts (e.g., electrical conductors, moving parts) and the ingress of solid foreign objects (e.g dust) 3) 6 is digit indicates the level of protection that the enclosure provides against harmful ingress of WATER. 9K – powerful high temperature water jets! (It should be noted that: 7 and above rating is rare, and you can met with some professional or military equipment only) So, you can be sure that Nitestrøm rating IPX6 is far enough for using in rainy days or your fishing, kayaking, swimming (not diving). When in motion sensor mode, does this shut off when moving head too quickly or running? Does it shut off when you don't want it to? Not at all! The Sensor works within range of few inches with specific hand gestures and never gets affected by any other unintentional movements. With a hand wave will the red light go on and off or just the white light? Yes all lights are motion detected once the motion sensor is turned. They have very clear detail simple directions on how to switch between light modes. Red light is very bright as well for seeing in the dark to protect your night vision. Both lights (red and white LED) can be controlled individually with hand gestures. It’s completely touch free once powered. Sensor assisted operations also save batteries with optimized usage. Best utilized almost for each activity, perfect for outdoors like Hiking, Mountaineering, Climbing, Hunting and Running, Backpacking, Military use, Map reading, Signboards reading, Boating, Kayaking, Canoeing, Skiing, Snowboarding, Fishing, Training on trails, roads, deserts, jungles, beaches, and mountains, Managing Power Failures, Electrical works, Plumbing work, Search and rescue operations, Automobile repairs at home or roadside, Household chores and walk your dog. Can I use this to read at night? Yes. The light is comfortable enough to wear while reading, and the variable light settings allow you to pick how much additional light you need. 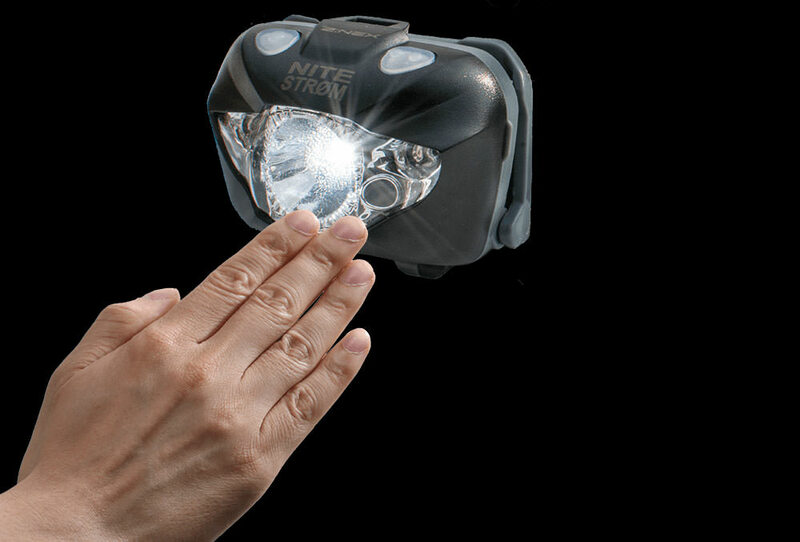 We are so confident about this headlamp that we offer a 100% satisfaction guarantee. If you’re not pleased with your purchase from ZNEX.de, just contact us within 30 days and we will give you a refund or replacement.